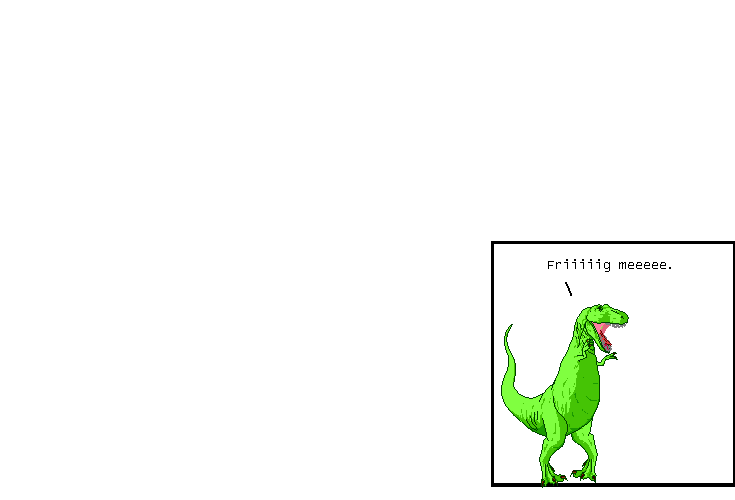 Dinosaur Comics - April 1st, 2008 - awesome fun times! –"Guilty as charged!" T-Rex laughed, opening the door! April 1st, 2008: After some tense negotiations, Jeph has agreed to give up my comic, I'm no longer holding XKCD hostage, and Randall will set Questionable Content free! Thanks to everyone who played along yesterday while we swapped index pages. Of the email I received, about 85% got the joke and thought that it was a pretty okay thing to do on April Fools' Day (and a few people fell for it hard, checking their hosts file and trying to find a reason why the comics would be on the wrong pages), and about 15% accused me of hacking Questionable Content, with one person threatening to fill my inbox with spam if it wasn't returned "within two weeks". I am well ahead of the deadline, anonymous QC reader! !